It was one of the most doggone things you might ever see. 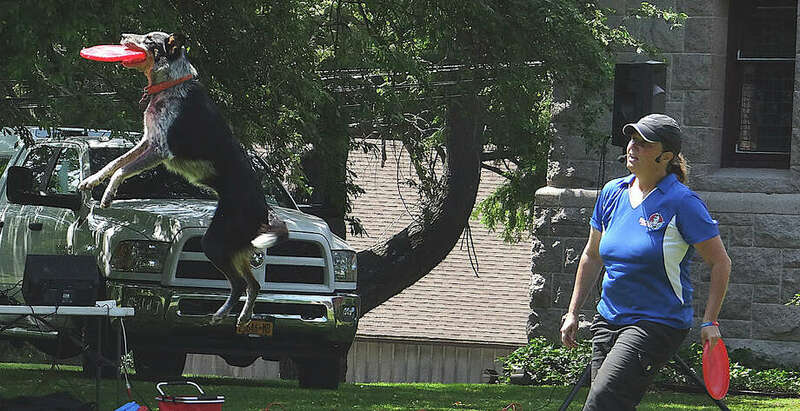 They flipped, raced, tumbled and sprang high in the air, catching Frisbees left, right and center on the Pequot Library's Great Lawn on Saturday afternoon in a display of remarkable canine contortions. Four of "Marvelous Mutts," co-owned and trained by Kara Gilmore, paid a visit to the Southport library for a show of doggie acrobatics coupled with information about safe dog handling and pet selection. The pet performers were Squeak, an Australian cattle dog; Smokey, a border collie and cattle dog mix; Bam-Ba-Lam, a black Labrador, and Shazam, an 18-month-old mutt. All dogs in the program have been rescued from shelters, and perform around the country at fairs, festivals and schools.